Depicting realism on the big screen is an effort that needs to be lauded, but getting too technical about it and using jargon/lingo that is difficult to comprehend by the commoner can boomerang. This is what exactly debutant director Kabeer Kaushik does when he begins narrating 'Sehar'. He takes you about a decade back in time when the state of UP was beginning to get engulfed in the ugly world of organized crime". A kind of crime when power was not meant to be distributed. Instead it was meant to be 'varjasv' which means total power. The power that cannot be taken or given. It can only be 'earned'." 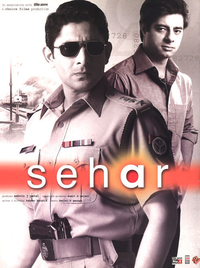 Seher talks of the origin of organised crime in North India and the measures taken to bring it under control.